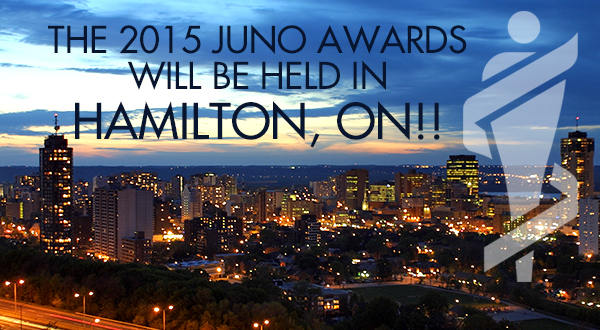 The Juno Awards are Coming to the Hammer! Last week, the Canadian Academy of Recording Arts and Sciences (CARAS) announced that the Juno Awards will be making their way to Steeltown in 2015. This will include not only the actual awards on March 15, but a week of Juno celebrations starting on March 9, so save the date! Events will include the annual Juno Cup, a hockey game between NHL oldtimers and celebrity musicians; the Juno Songwriter’s Circle, with some of Canada’s best songwriters sharing their music; the Juno Tour of Canadian Art and Photography Exhibition; and a number of concerts and other events taking place before the actual award show is held at Copps Coliseum. This isn’t the first time the Juno Awards have come to Hamilton, but it is certainly the first time in quite a while. The last time the Junos were hosted in Hamilton, it was 2001. Apple had just launched the iPod and music from S Club 7, Destiny’s Child, and Lifehouse topped the Billboard charts. Needless to say, it’s about time! Hamilton has emerged as a city rich with cultural and intellectual life, so what better place to bring the award show to life in 2015? The Hammer is well known for its art scene, but the music scene is just as vibrant. Last year, Hamilton had four Juno winners (Monster Truck, Steve Strongman, Elliott Brood, and The City Harmonic), but there are a number of other musicians in the city to be celebrated. In fact, the Juno awards aren’t the only award show hosted in the Hammer. Every year Hamilton hosts its own music awards celebrating musicians from the city and surrounding area, and there are a lot of talented musicians to be found. Monster Truck, who released their album Furiosity in May of 2013, won last year’s Juno for Breakthrough Group of the Year. They have been active since 2009 and released two EPs prior to their album. One things for sure, Rock n’ Roll isn’t MIA when Monster Truck takes the stage. Check out the lyric video for Monster Truck’s The Lion, and keep checking PTB to immerse yourself in Hamilton’s music scene before the Junos arrive in 2015!